As the city grows, as business and tourism rebound after the political upheaval of the past few years, Bangkok’s rail transit gets increasingly crowded. Following the opening of a two-station extension, the first across the Chao Phraya River, the Skytrain recently put into service new four-car trains on the Silom line. 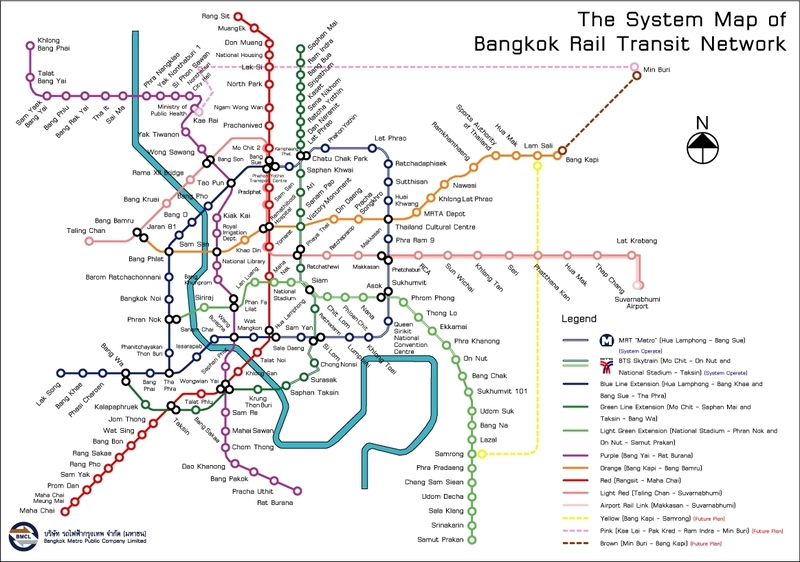 At the same time, they have ordered additional cars that should arrive in the next year or so to enlarge the existing three-car trains, all of which will be placed on the Sukhumvit line. Riding on one of the new trains recently, I was surprised to look at the system map posted over the door and discover nine stations that I had never seen before. 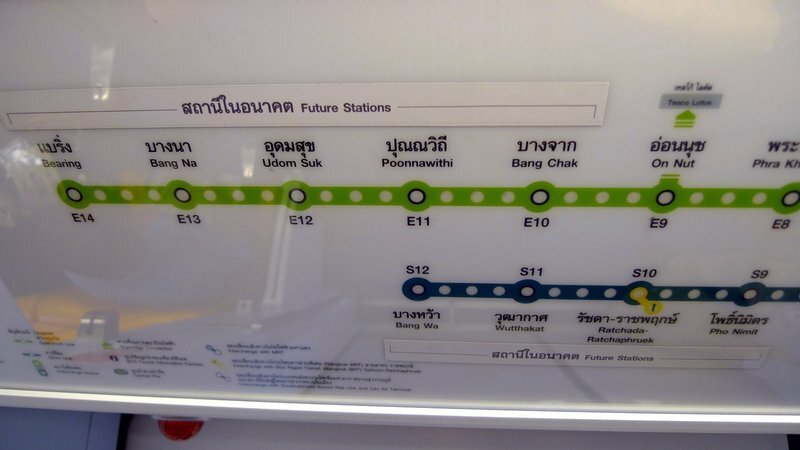 In a fit of extreme advance planning, the maps show not only the five stations that are scheduled to open at the On Nut end of the Sukhumvit line in August 2011, but also the four stations that will be added beyond Wongwian Yai station, across the river, sometime in the later part of 2012. Needless to say, the advance planning didn’t include the “Future Stations” stickers, so for several weeks passengers were scratching their heads, wondering whether the new stations had surreptitiously opened. The stickers have been added, though, so now everyone can admire all of the new stations they have to look forward to. Along those lines, Tawn and I were on the northwestern outskirts of the city this past weekend visiting friends’ new baby, and we came across two sections of new rail construction, one definitely the “Purple Line” and another that was a bit confusing. It is either part of the Purple Line or else may be part of the Red Line, although I didn’t realize they had started building it. In any case, I’m excited to see that some significant signs of progress are being made in extending the mass transit infrastructure here in Bangkok. It may take a few more years of pain, but the results should be well worth it. All we need to do now is to integrate the buses routes into the rail system and we’ll really have something going! This entry was posted in Uncategorized and tagged Bangkok, BTS, Krungthep, Mass, rail, Skytrain, transit by christao408. Bookmark the permalink. We do need something like that in our area. The buses are fine but no real mass or rapid transit. good stuff =) progress in infrastructure is a great thing…so long as no one gets displaced unjustly. Good news then, tourists can venture out more! how many stations will there be total? want to come and see Bangkok then!! isn’t that good? the development is getting faster and fast…..
hmm… wish we had good public transit, but it’s nowhere to be found around here. Since we are on the subject, did you get to Mustafa ok? I drove passed the area during the weekend and Nick was right it was Farrer Park station. I hope you trusted Nick more than you trusted me. Yeah they better get everything running smooth by May of 2012. The International Rotary Meeting is going to be held in Bangkok. can’t wait to come! @ZSA_MD – Oh, we’ll just take you around by car if it isn’t. Ha ha…@icepearlz – Did make it in one piece. As I got on the train, I recalled Farrer Park as being the correct station from a previous visit. Made it in one piece but got caught in a bit of rain on my way back to the station. @kunhuo42 – @Fatcat723 – @murisopsis – And what with the Republicans’ desire to cut the budget at the expense of investment in the future, chances are there won’t be any good transit there in the next few decades, either. =(@agmhkg – Yes, I’m almost amazed …@alwateen – Okay, mark your calendar for late 2015 and it should all be done by then! Ha ha…@ThePrince – In this case, it is all being built along railroad right-of-ways or above/under existing streets so there should be any displacement. @CurryPuffy – To totally random suburban neighborhoods? @oxyGENE_08 – Hip, hip, hooray! @yang1815 – Current subway is 1 line with 18 stations with 21 additional stations under construction on two extentions to be completed in 2015; Skytrain is 2 lines with 25 stations currently, expanding to 34 stations by late 2012; Bus Rapid Transit is 1 line with 12 stations; Airport Link is 1 line with 8 stations; Purple line (under construction – first part in 2014, second part in 2019) will have 16 stations. All in all, a comprehensive network. @christao408 – danggg I think they should put all of them on there haha. @yang1815 – Well, it is four different systems so the maps only show connection points. Here is a comprehensive map of all current, under construction, and planned lines. @christao408 – But but in 10 years all of them will be integrated into one system with one card right? So then they’ll have to change all the signs again? !Perhaps there’s an app for the map? Haha.